These guys are young but they don't sound it. Their music is of the fifties, perhaps earlier. Their playing is hugely impressive, harking back to hard bop and post bop and Ellington and some originals, not least one that moved forward in time a decade to channel Ornette. 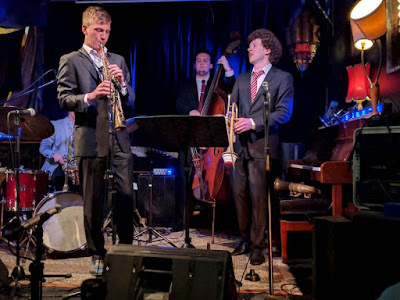 They are senior students, mostly fourth year, one third year, from Mount Gambier, somewhat unexpectedly the location of a major Australian jazz school, the James Morrison Academy. They show his influence, too. 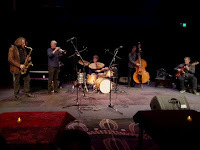 Hard burning playing of a period, well presented in suits with Mingal whoops and responsiveness to each-others' solos. Hard burning, very well tutored and well practiced. So young, and yet playing like this. 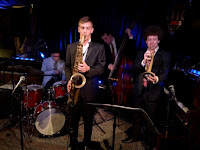 Lachlan Karl Hamilton led the band on saxes, with trumpet, bass and drums. No chordal instrument, so an open sound, willingly filled with immensely fat bass playing and drums drenched in dynamics. There were lovely harmonies from the two horns up front, occasional chords, but lots of firm, inventive bass lines, not least those impulsive urgent runs, and the kit that would weave and duck around the time then spatter with a fff cymbal or snare snap. 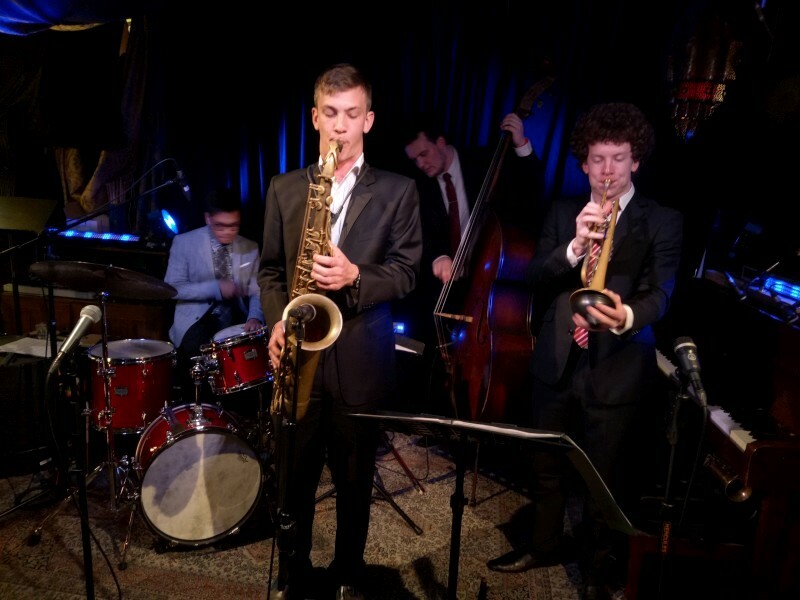 The tenor lines were respectful in melody and closed-eyes exploratory in improv, ably passing through sequences or delaying note to twist melody or just playing the right bluesy line with determination and comfort. Then Matt on trumpet, burbling or blaring, neatly spelling lines but varying them for emotional effect. And Harry behind on bass, urging, driving, fat toned with a two finger pluck and mobile in body as he spelt the changes and grunted his involvement and support. Such a good band, speaking in music of that time, modern yet definitely clearly sourced. 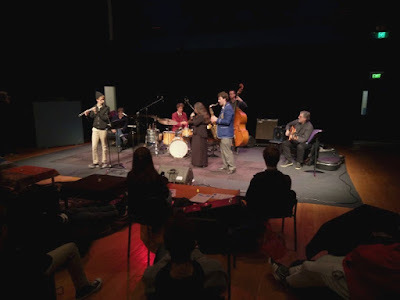 They played several originals, that Ornette syled piece, and a few others from Lachlan and one from drummer Patrick. Also a string of Ellington tunes as well as Cedar Walton, Out of nowhere, Vertigo, Misty. There's clear historical reverence here, especially around Ellington. Young ones or Young guns, whatever, they were good. Hot players sitting nicely together. These are guys to watch. 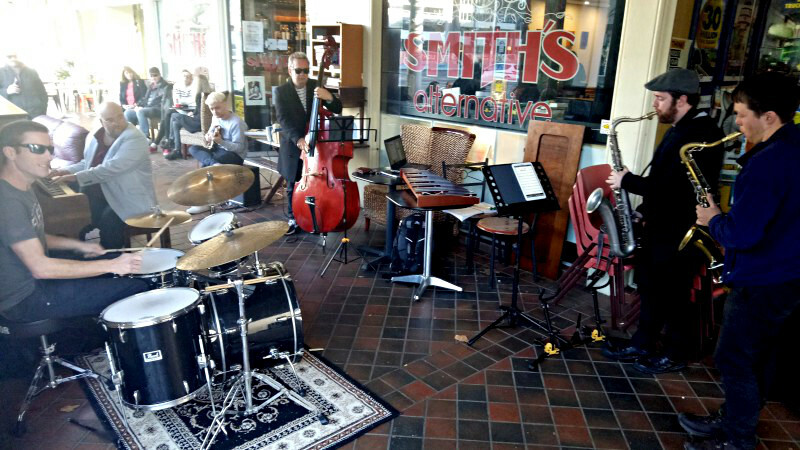 Lachlan Karl Hamilton (tenor, soprano) led a band at Smiths with Matt Nichols (trumpet), Harry Morrison (bass) and Patrick Danao (drums). It was a theatre piece about 7 great inventions of the modern industrial age and it finished by musing on the next seven, which has me wondering how they chose this seven. They were telecommunications, aviation & space frontier, advent of convenience (esp household appliances), the mechanical brain, massed world warfare, biomechanics and medical marvels and the advent of film. It's an interesting collection. I'm not a film buff, but they had me thinking there was justification in its inclusion. 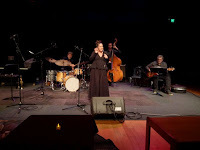 The performance featured one host, Dene Kermond as Harry Hawkins, with music written by Sally Greenaway and performed by the Syzygy Ensemble. Harry's a genial period person, dressed in fineries and arriving by Zeppelin, leading us through various inventions and implications and provoking both laughs and thoughts. I liked this. He reponded to a mate, Ziggy, , presumably in the Zeppelin, through Morse, and sometimes interacted with the largely mute musicians on stage. Mute ohter than for their performances, which were both musically satisfying and very nicely performed. So, a melange of ideas and text and music with real-world relevance. I liked it immensely with its steampunk presence and vivid filmic musical presence. And I was convinced: "great inventions change us ... what we do and how we think". Even for film, real but fanciful but serving to bring people and cultures together, to promote understanding. There was awareness of good and bad in all this, "horror and hope", as in the best of inventions from war, through being cruel to eachother. And of convenience that saves time, questioned when Harry quizzed on how much spare time the audience has. And I was fascinated that both spyglasses and cyborgs could be associated in that they both extend our abilities. Otherwise, the music. Syzygy comprised a sextet, piano, violin, cello, clarinet, flute, percussion. Largely inert on stage, other than playing, but sometimes reacting. The percussionist played the Morse-coding Ziggy. I have always mused that my grandfather saw the birth of flight to the landing on the Moon, and what a change that was. Now the moon landing is 50-years old (I remember gathering in a hall at school to watch it, ~2.30pm local time). Time passes. The technological goods and bads. Now we fear for the future and climate. So it goes on, until perhaps it doesn't. Entertaining and interesting show - it got me thinking. 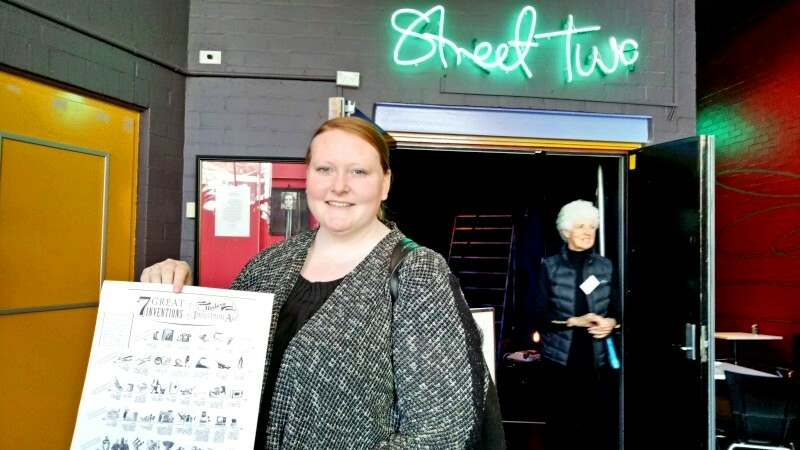 7 Great Inventions of the Modern Industrial Age was performed at the Street Theatre. 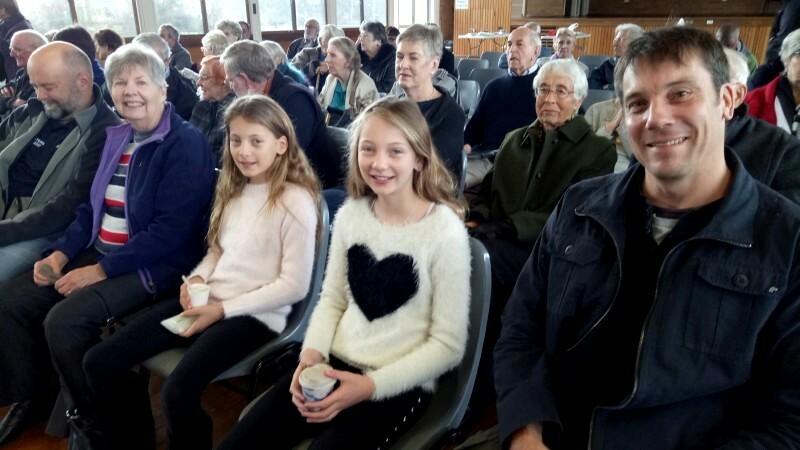 It was composed by Sally Greenaway, written by Magenius (Paul Bissett and Catherine Prosser), performed by Dene Kermond (Harry Hawkins) with music by Syzygy Ensemble. After the workshop, the gig. First up was Palaver, comprising Miro and John from Canberra with Ronny, Geoff and Tom, Michelle Nicole's band. What a delight this was. Very different from Michelle singing standards. This was free music, unscripted, uncomposed, played in the minute. But this is free from highly trained jazz players and the awareness and comfort with harmony and rhythm and standard instrumental techniques is evident. This was glorious, sensual, grooving, intense or playful; great tone, odd polyrhythms, settled grooves, comfy crossing rhythms. It started with Geoff laying down a feel on his woody-toned guitar, the drums and the rest. Both horns were blissfully tuneful while open-eared and exploratory. If anything, it was the rhythm players, bass and drums, that were playing for colour while the lead instruments spelled melody. This is free that's easy to partake of: stella. Michelle came on and the style changed. Still overwhelmingly capable and satisfying and beauteous, but based on the standards repertoire: Once upon a dream, Too marvellous for words, I like the sunrise, Do nothing till you hear from me, Drop the smile Ellington Diga Diga Doo and Caravan. These are standards but done with great agility and freedom and interplay and with the addition of two star horns. It was an expansion on the tone of Michelles's band. I drooled over solos by both Miro and John, richly toned and improvisationally intriguing, but they retained a professional reserve as the sit-ins on the night. (That's a good lesson for excitable sit-in-ers). All things of wonder. Stella(r) playing and stunning vocal skills. What a wonderful concert. 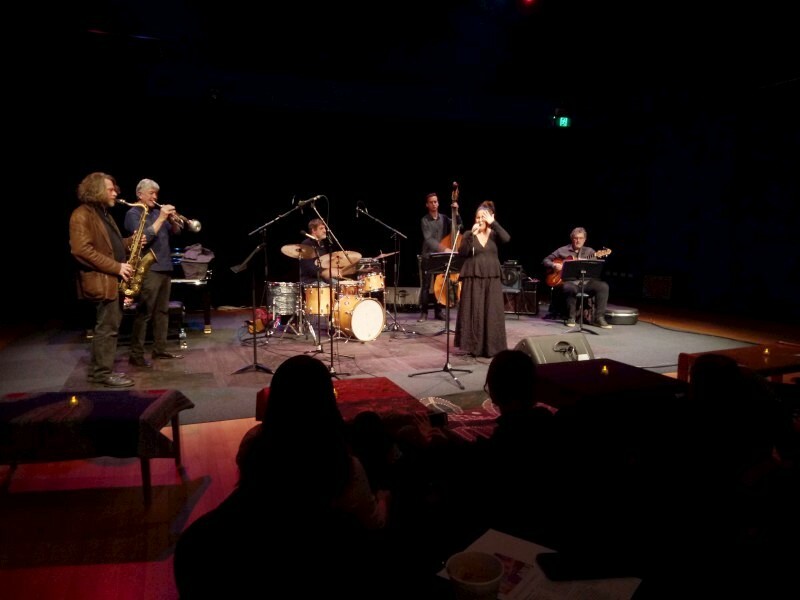 Michelle Nicole (voice) sang with Geoff Hughes (guitar), Tom Lee (bass), Ronny Ferella (drums),Miroslav Bukovsky (trumpet, flugelhorn) and John Mackey (tenor) at the ANU School of Music. The band without Michelle performed free jazz as Palaver. Michelle Nicole and her band started their visit to ANU School of Music with a workshop. First up, the most delicious rendition of There will never be another you. I was stunned. I know Michelle can sing and I remember feeling much the same way last time I heard her, but still I was stunned. A neat band with understated skills, a readiness to move and twist and play together, and a long history to support playing like this. But still I was stunned. Michelle is just so inventive, so involved in her songs, so free with her invented melodies, playing through chords or scales or whatever, but always with purpose and her light and immensely managed voice (I could say agile if it hadn't been appropriated by whomever). Then some talk, mostly from Michelle, but also from the band. Michelle had started on violin and played all manner of bands and plays piano and more but voice is her love, "it's easier" (jokingly, I suppose). She works things out on piano. Geoff talked on the pleasure of the band, not least as a guitarist in a piano-less outfit; of "trying to be more pianistic"; of an interest in all players for their different musical personalities; of freedom to play other than instrumentally-defined roles (alhtugh you are sometimes booked for just this). Finally advising to "get some buddies, stick together, play some music" [ie long-term]. Tom talked of role playing but seeking to stretch. Ronny talked of the 'listening drummer', of finding what's right and being flexible, musical, challenged, but also of an ability to "repeat and act" [essentially, play a groove]. Then from all, some more: develop your ears, transcribe (although not necessarily to paper); jazz as a chamber music, as a "self-organising organism"; a good band will accept members' inventions and play with the risk; "every instrument has its bag of tracks" but take time, enjoy melody and simplicity; slow down, get simple things right; for voice, make a good sounds, be able to sustain a note without vibrato, think like and instrument so voice is a peer. Then some student came up, some talking, some questions, some advice, always open and inviting. Jazz is like that. Commitment is all, improvement is forever. Michelle Nicole (voice) led a workshop with Geoff Hughes (guitar), Tom Lee (bass) and Ronny Ferella (drums) at the ANU School of Music. I met Sandie White when she came to Smiths to hear the impeccable Michelle Nicole. 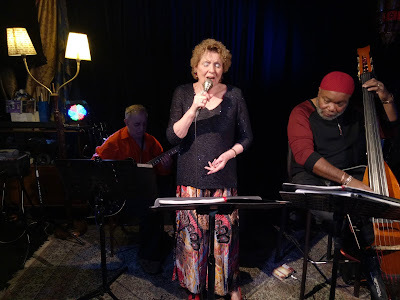 This was Sandie's return to play the room, on a Sunday afternoon, down from Sydney, with Welsh import Esmond Selwyn on guitar and our own local, Eric Ajaye on bass. When IU listen to jazz singers, I remember that songs have themes, words, meanings that are evident, often sentimental or maudlin, occasionally tender. The songs of the jazz era were like that, but I love it. Sandie sang some lesser-knowns like Peggy Lee I never knew, Lee Wiley Oh look at me now, Nat King Cole Just me just me, along with Misty and September in the rain and the like. 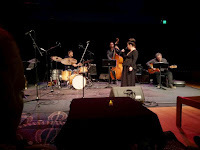 All lovely, all poignant, but the jazz improv showed through, too. Sandie sang several scats that rang with jazz movement. Nice. Esmond accompanied with celerity, all staccato chords and lithe, hasty lines and sweeps, and a free take on one-man improv especially over the ballads. And how great to hear Eric again - it's too seldom these days. All smooth and flowing and mellifluous, but quick and endlessly conversational. Loved it. A pleasure to hear in such an intimate, drummerless grouping. Great that Sandie discovered Smiths and came for the outing. Perhaps next time, for an evening with a more generous gathering: it may have been warm within, from heating and an inviting performance, but the sunny arvo had a bitter breeze. Sandie White (vocals) performed at Smiths with Esmond Selwyn (guitar) and Eric Ajaye (bass). It was an orchestral practice interrupted to set up for a Tilt gig. I was sorry for the first, enjoying Mendelssohn and missing a Tchaikovsky symphony (no.2 - it's great). But duty calls in the form of a gig at Mercure Canberra, long known as the Ainslie Pub, for the Canberra Truffle Festival. Truffles in an adjacent room; bar through another door. We had the stately lounge for jazz and it was a blow from the first. Busy, some dancing, easy chatting and a few listeners. We played jazz and standards and blues and some modern with substitutions and polyrhythms and the like, and also some jazz-twisted pop tunes, not least a new one from Daft Punk. At least new to me. I'm a great believer that everyone should have something they recognise: when they do they come onside and are open to standards, Shorter, Miles, whatever. I sometimes wonder how we can get paid to do this, but they like it and so do we. Then next day, the Smiths jazz blow. Strong on bassists. Brendan Clarke was playing as I arrived. Eric Ajaye was inside to play a gig after the jam session. The house bassist was Jace Henderson with fellow bandsters Josh Buckler, Hugh Barrett and Mark Levers. I played a few tunes with a singer, not least Honeysuckle Rose, then Beatrice again to finish off. Thanks again to Josh and co.
We were in Adelaide for a few days and caught the Kegelstatt Ensemble playing very locally, at Burnside Ballroom. 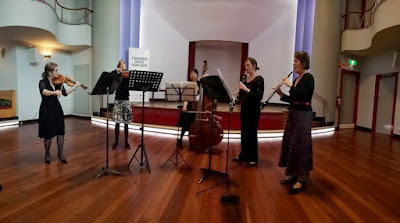 They were seriously satisfying, playing to a small audience of 50-or-so in a heritage '50s ballroom, performing four works in four different combinations, all modern and testy and challenging. There's lots to note, but much of interest was how unknown these players were to me. Adelaide is a good distance from Canberra, so we get few visitors from there. 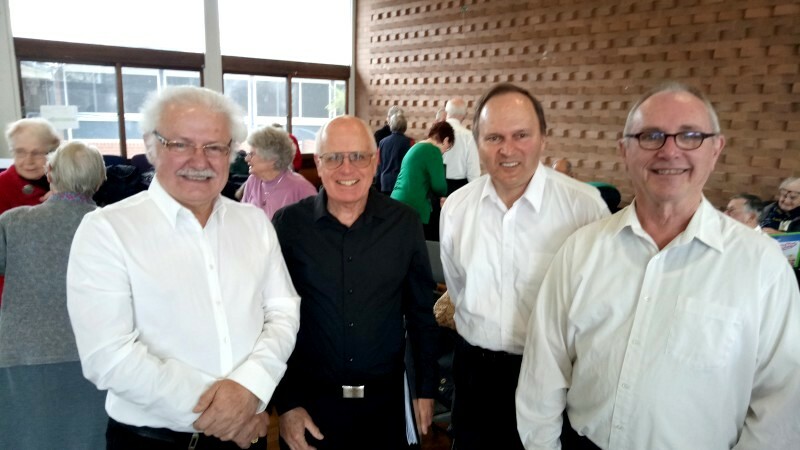 This group was interested in touring to Canberra if promoted - they were playing this program at the Melbourne Recital Centre salon in a few weeks, but that's relatively close. Like many groups, no doubt. 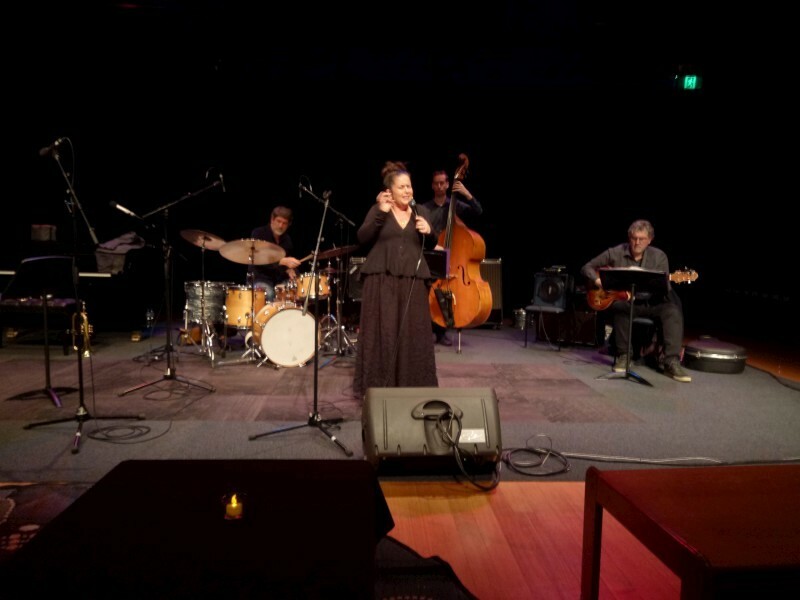 Canberra shares some of the Sydney scene for both jazz and classical, given its proximity, and occasionally the Melbourne scene, given its location on the path to Sydney. I remember a few Brisbane and Adelaide and Hobart and even Perth visitors, but that's dropped away with the diminishment of our music school. So no surprise that I didn't know of this group. But they were interesting and capable. A challenging program of modern works: Schulhoff, Elliott Carter, Ginastera and Prokofiev, and a capable series of players, presumably out of Adelaide or graduates of the Elder Con, some now interstate, playing for the Adelaide and Melbourne Symph Orchs amongst others. And interesting for the techniques of modern works. The Elliott Carter Esprit rude esprit doux was introduced with examples of polyrhythms that suffuse the work and demanded much practice (30-hours for 4-minutes); the example was 6 against 5. I'm amused when I discover the crossovers between jazz and classical, like diminished runs in Beethoven, and polyrhythms are common in contemporary jazz circles. I've attended several workshops on jazz polyrhythms and written them up on CJ (Will Vinson, Ari Hoenig). The Prokofiev Quintet Op.39 was a favourite, six short movements, some rabidly challenging writing performed with lithe clarity. 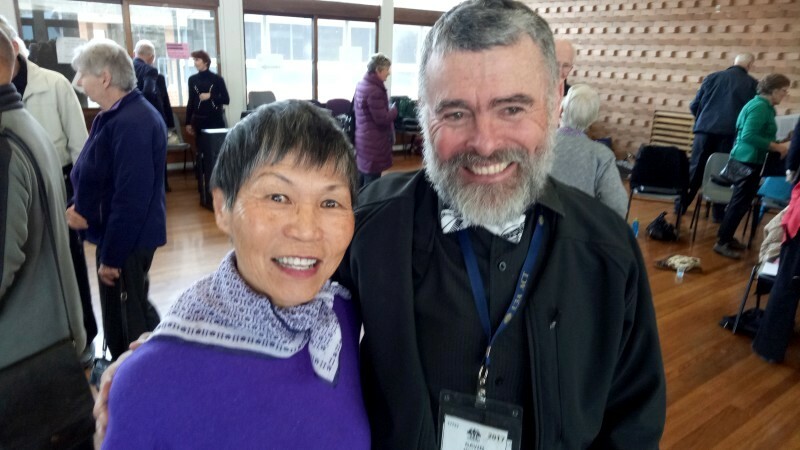 I noticed especially on the strings, which I understand better, and especially from bassist Esther Toh, so sharp and well timed semiquaver runs and capable up into stratospheric harmonics and high thumb positions, and with such a satisfying tone from a determined bow and her modern Italian bass. It all happened in a little decorated '50s ballroom where my mother has danced, red piping with rope features, timber floor, rest bays and an odd inverted-V bandstand with a glowing aquamarine double border. 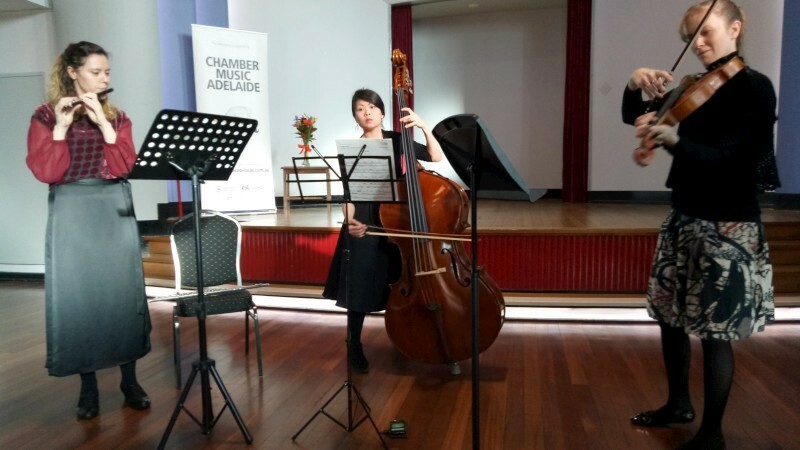 It's the location for the Ballroom Series concerts of Adelaide's CMA (Chamber Music Adelaide). All unknown to me, from Canberra, quite far and in a different arts ecosystem. All worthy discoveries out of this fabulous concert. 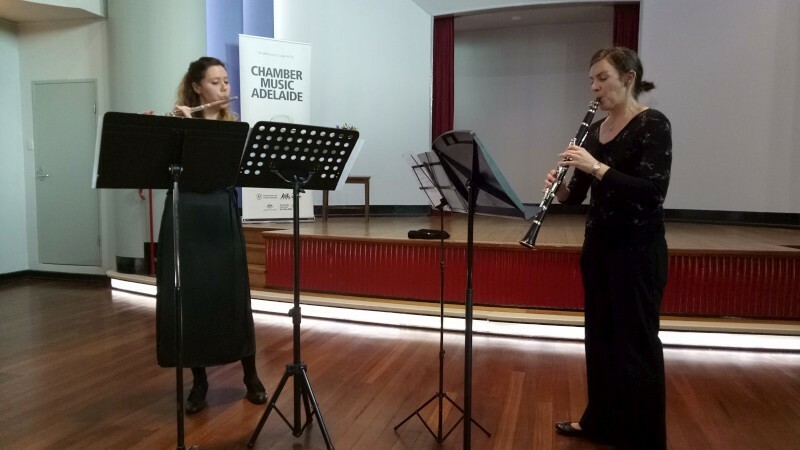 The Kegelstatt Ensemble performed Schulhoff, Elliott Carter, Ginastera and Prokofiev at the Burnside Ballroom in Adelaide. The performers were: Alexandra Castle (flute), Renae Stavely (oboe), Steph Wake-Dyster (clarinet), Emma Perkins (violin), Anna Webb (viola) and Esther Toh (bass). This may have been the most harmonious Harmonia Monday gig that I've done. It started with a thing of beauty, Saint-Saens Ave verum corpus, then Stravinsky Ave Maria. The Saint-Saens was just heavenly and I liked the Stravinsky for its changing counts and unexpected rhythms and intervals. Then a few Victorian-soundings things that invited apt accents and a strange one, Banchieri Contrapunto bestiale alla mente. That one sounds strange and it was but it amused and was easy to learn and remember, mostly for tenors who just barked (yes, arfs) regularly as a bridge between Fa-la-las. 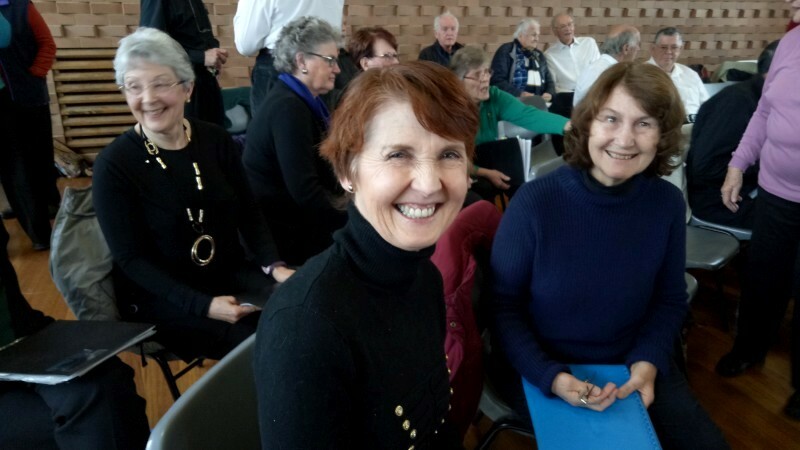 There were tunes from Schubert and Mendelssohn and Grainger and Elgar and the like with themes ranging from religious to indulgent, even carnal. 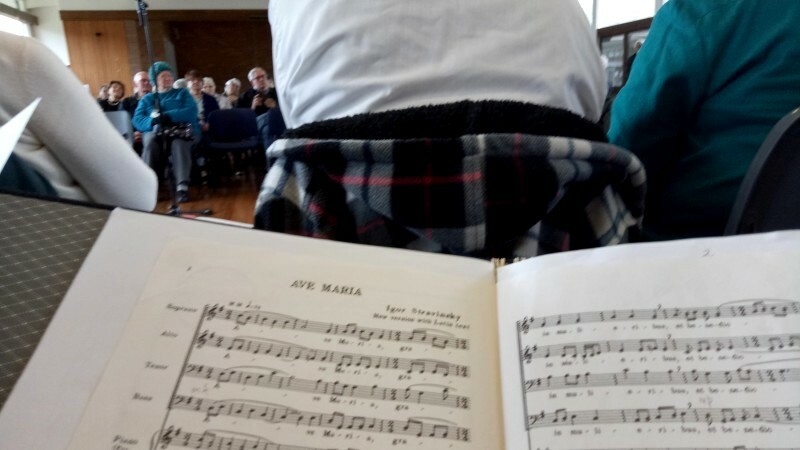 But along with the glorious religious songs above, I fell for a few madrigals dated around 1450, from Morley, Sing we and chant it, and Dowland, Come again sweet love. There's some schmaltz out there, of course, not least from Schubert with lyrics by Shakespeare. Unlikely? Try Who is Sylvia? Lovely, fair, wise and with swainly commendations. But it's a good way to learn something of singing and reading and the music ranges widely and informatively. That's Harmonia Monday. 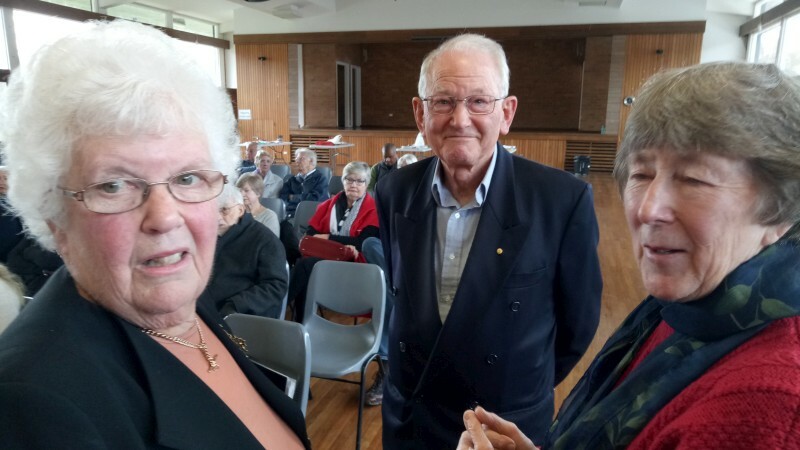 Harmonia Monday performed its bi-annual open day under Shiela Thompson and Oliver Raymond (conductors). The sun was out but it had been -7degC overnight, so it wasn't hot. 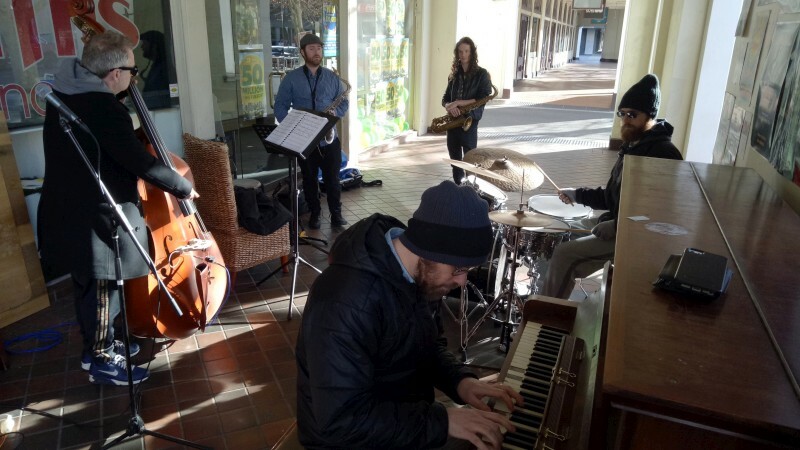 Nonetheless, the Smiths jam session was outside on the footpath using the public piano with its keys missing a few ivories. Cool out of the sun but it was a great session. The standard tunes. Josh leading with the house band. Sit-ins included recently relocated Brendan Clarke and Wayne Kelly for Miss Jones. I sat in for Beatrice with Hugh and Mark and Josh and others. Anthony Irving is the house bass: first time I've seen him and I was impressed. He's a leftie playing a bass set up as right-handed; think Hendrix. Some really nice music and good cheer and pleasant in the sun, until it got low and the cold set in. Then it was the end. Much enjoyed. 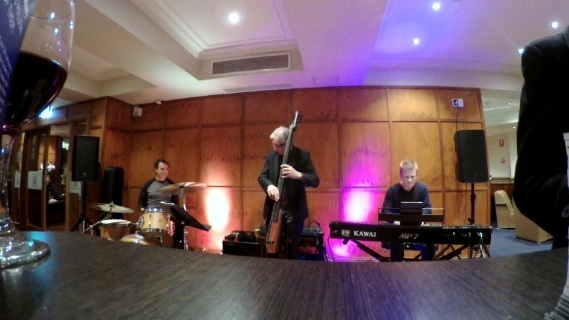 The Smiths Jazz Jam house band was Hugh Barrett (piano), Mark Levers (drums), Anthony John Irving (bass) and Josh Buckler (tenor). Amongst other sit-ins were Brendan Clarke (bass), Wayne Kelly (piano), Eric Pozza (bass). Two great concerts in two days; a pleasure. 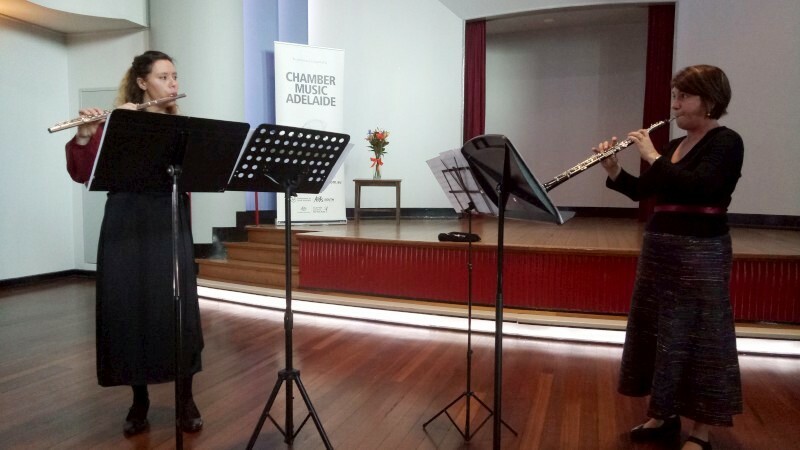 The second was Anthony Albrecht on his Bach to the Bush tour of ~20 locations throughout the Eastern states. It's an intimate thing, with a chat and even Q&As on offer, but that's not to diminish the music or its performance. Obviously there's Bach. 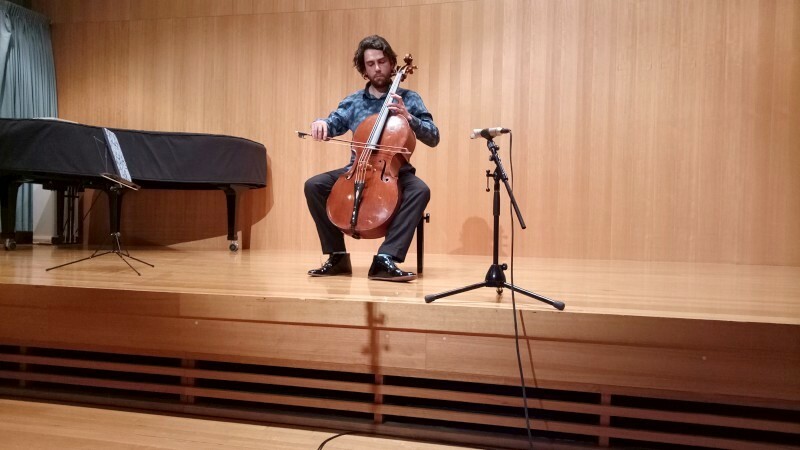 Anthony played two Bach cello suites, no.1 Gmaj and no.2 Dmin, introducing them with discussions and quotes on the nature of each key. The Gmaj is the best known and joyous and optimisitic. The Dmin is darker: we learnt that Dmin has been described as the "key in which a ghost would speak". Then later, a caprice by Dall-Abbaco written in Ebmaj, an "indescribably gentle" key. Also a Chaconne by Giuseppe Colombi and, at the top, a fascinating introductory piece that was very much out of left field, Reclaiming the spirit by Sarah Hopkins. This work was commissioned and played at the renaming of Uluru and it vividly portrayed Australian bush sounds and the didj. It took mammothly different technique, a readiness to break long training and a regular concert bow to play and was engrossing and convincing. All the tunes had a story as an introduction: a recognition of the local Ngunnawal people; a discussion of the cello's appearance (mid C17th, Italy, as a smaller bass instrument with the new technology of gut strings sheathed in metal); an introduction to Anthony's own 1740s English cello; music as acknowledgement of dark places; of Bach's own history, his loss of 10 from 20 children and his devout religion and composition that was structured in lines with this devotion (eg, in St Matthew's Passion, counted bars, multiplied by the golden mean, bring you to the crucifixion!). All informative but this is not the music. I loved the Hopkins Australian piece, all vivid bush and didj. I was intrigued by Anthony's takes on Bach, light, sometimes flighty across strings, using the more delicate baroque bow. How he paused on the root notes of a phrase, then floated over the arpeggios and scalar phrase that followed. Not the even, determined baroque we sometimes hear or expect moving through exercised sequences, but deeply expressive and delicately phrased, speaking through harmonies of heavenly spheres. Baroque spoken by another age. So, lovely and informed by era and deeply satisfying. 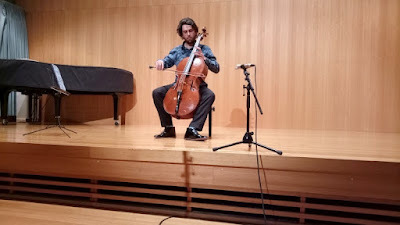 Anthony Albrecht performed at Wesley on his solo Bach to the Bush tour.